Stuck With Your Internet and Affiliate Marketing? Don't Be, Ask Me! Okay guys… Got something a little different for you today. What it is, is I’ve got some time to kill so what I figured I’d do is find out what your number one internet marketing related problem …Then… With the best of my knowledge – I’ll try my HARDEST to answer your question the best I can right here on my Blog. So whatever your sticking points are – whether it’s getting started, building websites, SEO related stuff, outsourcing, listbuilding, Affiliate marketing… Or any of that jazz (and providing I know the answer that is), just drop a comment below and I’ll reply below it with comment that’ll (hopefully) help you overcome your little internet marketing problem of yours. Now don’t worry, I don’t expect anything in return… All I get out of it is getting to know you guys better and some good old karma coming my way. But if you could help spread the word of this post just by hitting one of those fancy lookin’ social buttons you see floating about the page, then that would be a BIG help. Now the the only thing is, I expect to get A LOT questions and I’m doing this all on my lonesome, so I may not be able to answer every single one. So if you’re one of the ones that don’t get answered, please don’t take it personally, it’s just that I’ll be overwhelmed with questions that’s all. Anyway that’s enough of me rabbling on like a madman… Lets find out what your “sticking points” are and see if we can overcome them together. So that said and done… bring it on! P.S. I’m afraid I won’t be able to keep this free Q and A session open forever for the obvious reasons (If I need to explain why, you’re truly beyond help!) 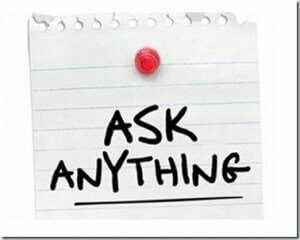 So make sure to get your questions in as soon as pos to make sure your question has a good chance of getting answered. I want to promote a product on youtube. I purchased a PLR product/ guide. How do I attach or include the product info. on the video? Thanks! Going of what you’ve written, what I’d do is make a video talking about the benefits (You can get the benefits of the sales letter as a lot of PLR does normally comes with prewritten sales letter) and make sure to make the video as short as possible as the longer the video is, the less people watch it, so make it about 10 to 30 seconds long. Then you want to make sure you have a strong CALL TO ACTION at the end of the video telling them to click the link in the description box (This should take them to the sales page of your prodoct or squeeze page – I would always recommend squeeze page btw). Your call to action can be in audo i.e. you saying it, written in the video and you can use annotations. For best effect, use them all. Hopefully this as answered your question! Heh James, Is there anything for a newbie to earn good money with very little knowledge. I’m afraid, to make real money i.e. something worth making – not pennies, then you’ll have to learn internet marketing to some degree. Thankfully there is a like a million ways you can do this. However the one that doesn’t involve hardly any knowledge is making videos on Youtube and activating the ads feature. it’s like Adsense… Well it is adsense but instead of it being for your site it’s for your Youtube video/s. However the trick to making this work is to simply make “talking head” videos on subjects that are gettin A LOT of media attention at the time. When I said “Talking head” video, all it basically means it’s you talking on a webcam, sharing your views…. And that’s it. But the trick is, is to do it on hot subjects as there is hardly any traffic generation on your part as it’s already there. What I can do is recommend a course to you? It is a proven course that I can fully endorse but I will worn you, there is work involved and it will take time to start seeing results but if you stick it out… You will see results and start making money, and lots of it in a automated fashion… But like said, it’s not your flash in your pan stuff, it requires work. Anyway, hope this helps to some degree John. What is the best way to organically build traffic for a list? What are the free methods? I know the paid methods. I have all the tools to build links myself. I got no money right now. I am short of cash and want to make some $300 fast. I can write content. Is there a way I can make $10 per article or $20 per review article on the WarriorForum or from some place? Yeah, outsourcing is a great idea… Providing you do it right. Btw, the only problem with these type of backlinks is they’re very hard to get index in Google. You can do this manually but to be honest it can be a lot of work. The best service I use is BacklinkBooster. It’s a great service and it automates your indexing completely. Another place to get backlinks is the Warrior Forum. As you’ve got the SENuke and Scrapebox style backlinks sorted from Fiverr.com, then you want to get contextual backlinks from here. To find good person to outsource these backlinks, just head to the WSO section and in the search bar, do a search “Blog Networks” and that should bring up loads of backlink dealers where you can get contextual/Blog Network backlinks. Word of warning though, Google last month deindexed a load of these Blog Networks to make sure you do your research by asking questions and reading all the reviews. But getting on the right Blog Network can massively boost your ranking as they’re high Page Rank backlinks. The secret to high priced articles is reputation. I’m afraid if you don’t have any rep, people don’t know you and therefore don’t trust you. What you’ll have do is to charge cheap but position yourself as a high quality writer and the reason you’re so cheap is because, you need testimionals etc. Once you have enough testimionals and social proof, then you can charge more for article writing as you have proof that you can deliver. Thanks James. As you can see, I gave you my website address which is my squeeze page. Q #1 IS Article Marketing the only way to build a list fast? Q #2 Does it work after the google panda update? Q #3 I have 150 PLR articles in different niches right now and I want to drive traffic to my site: . Can you tell me if the site is okay to start with? I can create a WSO about my site and publish a couple of testimonials that I have. The best FREE method to building a list (in my opinion) is forum marketing. It’s free to sign up and participate and you can start getting traffic straight away. The trick here though is helping others. The more helpful your comments, the more people will check out your signature link. An even more effective method is mixing article marketing with forum marketing. Basically just post your “helpful” articles on the forums instead. This can get you even more traffic. Also, if you can, try to use a eye grabbing graphic in in your signature box as this can get you more clicks as well. Another really cool FREE method of getting free traffic is ranking Youtube videos in Google search engines. Believe it or not, it’s actually 10 times easier than ranking a traditional website. 1. No, there’s dozens of way of building a list fast. The fastest way is to buy traffic. The methods I use to build a lightning fast list is doing Adswaps (they’re free btw) and buying solo ads. 2. It still can be done but it’s not worth the time/effort/money to do. If you want to go into article marketing then I recommend article syndication marketing. I won’t into it here as it’s a massive subject but that way of article marketing is very effective and is defo worth pursuing. 3. It’s okay but okay, for starters I’d get rid of the PayDotCom widget as your site’s purpose is to get you clients… You’re giving multiple messages away and it should be laser targeted to the people you’re trying to target. Also, you say you’re a copywriter. I don’t know about you but looking at the written content, it doesn’t look like it’s written by a copywriter. I would research copywriting more. I would like to get hold of a pdf with step by step instructions that takes a squeeze page-optin page with a free offer and drops it onto the main website as people are checking out the website. I would then like to be able to take the person to a sales then upsell and downsell pages with various offers and finally a thank you page. I need a pdf so that I can do this step by step and link up the different pages and where to insert the payment and follow up emails etc. I prefer it to be in a PDF format as I get lost stopping and reversing videos all the time. As you’ve probably noticed, I’m a video guy so I don’t have a lot PDFs floating about. Now this isn’t a PDF per-se but if you want to be taken step by step on how to do what you’re asking then I recommend Chris Farrell’s site. This guy is brilliant of explaining the most basic of basic things and he’ll be ideal for what you’re looking for as he’ll take you by the hand. Is there any way to make some quite quick money (such as empowernetwork)? Is there anything on Warrior forum you could recommend to give me space financially while I then either do an Alex Jeffreys or Russel Brunson course. For instance if you had nothing and had to start over quickly what would you do? I do enjoy receiving your emails. Am an old subscriber. Thank you for kind jesture to help. You are a true scholar and a gentleman. Have learnt last 2 years, the more I study and practice internet marketing, the less I know about it. For any newby, not in the computer field, must realise its a 2-3 year Varsity coarce you need to study, and put in a lot of hard work and time. Know now why so many newbys fail, nearly my self. Will ellaborate later, will be eye opener for you, if you will kindly give me oppertunaty. Have built up green3energy.com, listed top of 1st page Google. Recieving 50 plus WP, exceptional good comments per day to moderate. The money is in the list! Ok now have viral growing list. How do you save this list for future use, ie. auto responder, let alone delete and moderate? Can you suggest good auto responder, easy to work? It’s Inga-Lill here again, about the reselling of the Seo service again, (pls see the question on top of page) do you think this website I have set up is OK? Does it look too amateurish or not? (Well I really am an amateur and no website designer, ha,ha…) Too simple? Or Looking OK? As it goes I see a lot sites selling similar services looking very similar so it looks good. One way that would make it really stand out is testimonials… Video testimonials being even better. Of course that’ll come with time. Btw, here’s a quick tip for you. Do your first job free… Well for a testimonial anyway. You’ll find the more testimonials, the easier it is to get clients. If that’s the case, what I’d do to make some fast cash, I’d head over to Safeswaps: https://udimi.com/a/qsq4v buy a solo ad (You can get them dirt cheap over at Safeswaps) and promote a high converting affiliate offer. You can literally make money on the same day of doing the solomail. And even smarter way of doing it (but does require more effort on your side) is buying a solo mailing again but send the traffic to a squeeze page, THEN redirect them to a high converting affiliate offer. This is smarter as you’ll be making money while building a list at the same time… That’s what I’d do. …Seriously… Check it out, YOU CAN A LOT OF MONEY using Safeswaps. Just started to watch your rapid cash videos. Good straight forward information. You mentioned that quantity of videos is key. Specifically 50-100 videos. Is that for each product? Good straight forward info……………………………………………………..
You want to upload around 50 – 100 DIFFERENT videos to ONE Youtube Channel, promoting ONE product. …And if the product converts… Then feed the fire so to speak – if not – then start again rinse & repeat. Hey James it’s Gene P. here ,internet marketing newbe. Hope you’re doing great trying to do your free program the one that can get you $688 a day if done right.Almost done just having problems expanding the image in my Youtube page.Did you say I could have multiple gmail and youtube acct. as I think this will work great for me.One last guestion.How large should I expand the image.Dam! I want to get it done. Q: Did you say I could have multiple gmail and youtube acct. A: What I recommend to do is to setup a new Gmail account and use that one. So you don’t need to setup multiple Gmail accounts – just one new one will do. Q: How large should I expand the image. A: Which image are you referring to? Hey James,Gene here was looking to get a convincing profile image and play around with that channel art stuff which I know nothing about.It’s got to do with the youtube channel stuff.Does the profile image have to be a certain size and do I realy need to mess with the background on the side of the profile image to get results.Trying to give myself the best chance to get results.Wow you responded very quick. To answer your question: no, your pofile image doesn’t have to be a certain size – Youtube will automatically resize it to fit on your channel. And no, you don’t need mess around with the background of your profile image either. Thanxs James.Just going to keep at until I get results.I think I’m over working myself.Thank you for the advice James.Gene P.
And yeah, just take your time and you’ll get there eventually. Hi, how are you? I am shahan and I am new at affiliate marketing. i have just made my first bucks on the internet but I am stuck now. I have got some marketing strategies but I am not sure about it. Is there anything you can help me with?? I’m afraid this AMA ended a few years ago now. That said, I have tons of guides on this very blog you can checkout. So go the top of the blog and click on what kind of guides you want and you’ll find a archive free training there. Build traffic organically? And for free too? I would say SEO. If you go down this route, don’t expect overnight results – especially if you’re targeting competitive keywords. Another way is to use Quora and answer popular questions in your niche. That can bring you fast traffic for free so give that a go.